The Institute offers Master of Technology Programme in Geo mechanics & Structures (Civil Engineering). The course leading to the degree of Master of Technology will span over a period of Four Semesters (two years). The aim of the programme is to train the students in deeper theoretical knowledge which will enable them to tackle practical complex problems of design and development in industrial fields, as well as pursue further academic achievements through research. According to the directive given by Director of Technical Education, Kerala, 50% of the M. Tech seats will be filled by the College from the rank list published by DTE. Remaining 50% of the M. Tech seats will be filled by the College on merit. Candidates should have applied online to DTE. They have to apply to the College also. GATE qualified candidates will be selected from the rank list published by DTE. Candidates are requested to apply to the college directly. GATE qualified candidates will have preference. To prepare the rank list for College merit, score (in percentile) of GATE 2018/2017, marks obtained in qualifying examination, admission test/ interview conducted by the College and industry/teaching experience will be considered. GATE score – 60%; Marks obtained in Qualifying Degree – 20%; Admission Test/Interview conducted by the College – 15 %; Experience – (max.) 5%. Civil Engineering Geo Mechanics & Structures B. Tech/B.E in Civil Engineering minimum 60% aggregate or equivalent. GATE score card (for Candidates with valid GATE Score). Mark list of B. Tech/B.E degree examination (for all the semesters up to S7). Copy of relevant page containing candidates name in the rank list published by DTE (To be considered for admission from the rank list published by DTE, Kerala. This is not necessary to consider in college merit seats). Conduct Certificate from the institute last attended issued within six months from the date of application. Community & Income certificate for relevant category. Certificate from Parish Priest for relevant category. Affidavits by student & parent regarding ragging. The candidates should have undergone the Graduate course in an Institution approved by the AICTE and Universities/ Deemed Universities in India. Candidates should have a minimum of 60% marks aggregate in Engineering Degree examination. For SC/ST candidates a pass in the Engineering Degree course is sufficient. For SEBC (OBC) students, a minimum of 54% aggregate marks in the Engineering Degree examination is mandatory. Minimum 3 years of Professional experience in the field of specialization after acquiring qualifying degree. Candidates who have appeared for the final semester examination can also apply, provided he/she has passed all the subjects up to and including the 6th semester exam. Those who are having valid GATE score and who are waiting for the result of the supplementary examinations of the above or previous semesters can also apply. Confirmation of admission of such candidates shall be subject to the production of qualifying degree -satisfying clauses F (i) to (iv) as applicable on or before November 30, 2018 . A student can avail any one of the above scholarship schemes. 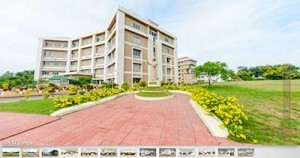 At the time of admission a student can apply for any one of 1, 2, 3or 4 schemes. 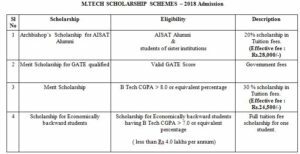 Scholarship schemes are applicable to both GATE and Non- GATE applicants. Merit Scholarship is awarded based on the CGPA/percentage at the time of admission. After the publication of final result, if the CGPA falls below 8.0, the scholarship will be cancelled. Scholarships are liable to be withdrawn, partially or wholly, in case of misconduct, deliberate concealment of materials/facts and/or supply of false information, and/or continued absence of more than one month except on medical grounds. Each student shall undertake 8 to 10 hours of work per week related to teaching and research activities as assigned by the institution. The students must secure first class or equivalent during the first semester examination to become eligible for continuance of scholarship. The student shall give an undertaking to effect that he/she will not leave the course midway or appear for any competent examination not related to Engineering and Technology. The students shall not receive any emoluments, salary, stipend etc. from any other source during the course of the study. They provide opportunities for the field/ industrial training of AISAT M. Tech students. These professional bodies will also be closely associated with the conduct of the P.G. course so that the gap between the academia and industry is reduced to the minimum.